What a day it was at the Centre Court Wimbledon this afternoon when the titans came to clash each other in the first semi final of the men's single event of the Wimbledon. The match between the defending champion and world no.1 Serbian Novak Djokovic and world no.3 Swiss Roger Federer ended in classic victory byt eh Swiss over the deffending champion. Federer having won the first set 6-3, lost the second set t Djokovic 6-3. 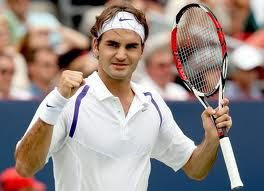 But thereafter, it was Federer commanding the Serbian and finally won over the match 6-3, 3-6, 6-4 and 6-3. Federer now marches into the Wimbledon final to realize his dream of equalling the seven times win record of of William Renshaw and Pete Sempras. The result of the other semi final between British no.1 Andy Murray and Frenchman Tsonga is awaited - it remains to be seen whether Murray moves to final and win over Federer to make history hoping to end Britain's 76-year wait for a male singles champion at Wimbledon or it is Federer who equals the seven wins record of William Renshaw and Pete Sempras.